WITH their tight jeans and shaggy haircuts, THE CASANOVAS are the perfect picture of rock'n'roll. But the band goes much deeper than image and its music matches all expectations. Formed in Melbourne in 1999, The Casanovas have spent the past 12 months swept up in a whirlwind of touring and recording. 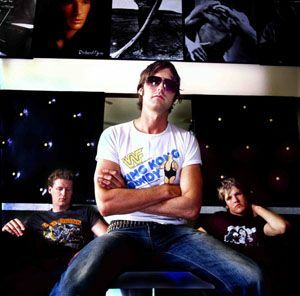 In 2003, the trio has already completed Australian tours with THE DONNAS and GRINSPOON and embarked on a successful tour of Europe, America and the UK with fellow rockers THE DATSUNS. Bass player DAMIAN CAMPBELL said the experience had been quite overwhelming but he remained aware things can fall as quickly as they rise. ``Things have been moving pretty fast and we've done quite a bit in 12 months,'' Campbell said. ``But what we do is the sort of thing that could end quite quickly. ``The rock industry is very fashionable and people's trends change, so I think you've just got to enjoy everything you do and get it while you can.
'' Campbell joined The Casanovas just over a year ago, uniting with brothers TOM and PATRICK BOYCE just in time for the band to begin its rise. ``It started off with Tom and Pat and the bassist JIMMY LEWIS out of the back of a cake shop in St Kilda with them all scrubbing pots down there. ``They decided to have a bit of fun with the band and gained popularity quite quickly.
'' Campbell stepped in after the departure of Lewis. "Pretty much straight after I joined the band we did our first tour interstate with THE DICTATORS and the rest is history, as they say.
" The Casanovas released their debut EP KEEP IT HOT in late 2002 and watched their style of retro rock really take off. The tour with The Datsuns saw the band complete 45 shows in nine weeks travelling through Holland, Scandinavia, France, Italy, Spain and Germany before moving on to the US. ``It was a pretty hefty tour because we did our own 10-date tour of the UK and then joined up with The Datsuns in Europe. "It was great fun because we're good friends with The Datsuns and they're big news, especially in the UK. "It's pretty hard to go over there for the first time by yourselves and have much of a response but being under their wing, it was great for us.
'' But even without The Datsuns, the band attracted plenty of interest from fans. ``Just before we left we had quite a bit of attention in the NME (music magazine) but I think the main thing for us was that we had really good responses from crowds. "We sold out our last show that we did in the UK, which was awesome, and everyone seemed to enjoy it.
" Back on home soil, The Casanovas kicked off their first headline tour in Melbourne last week and will perform at the NORTHERN STAR HOTEL on Sunday. When the tour is complete, Campbell said the band plans to concentrate on its debut album which it hopes to release in early 2004. ``The album is about half done and the single LET IT RIDE is coming out so we thought it was time for a tour. ``We've done a lot of supporting and that's good but now we want to really push this album out there and do a lot of things on our own.
'' The Casanovas will be supported by INTERCOOLER and MOTHERLODE.